"I'm like, 'How did this all happen?' Because I was like 100 weeks pregnant, dancing around in a $16 Amazon giraffe mask." This might be the cutest mommy meetup ever. 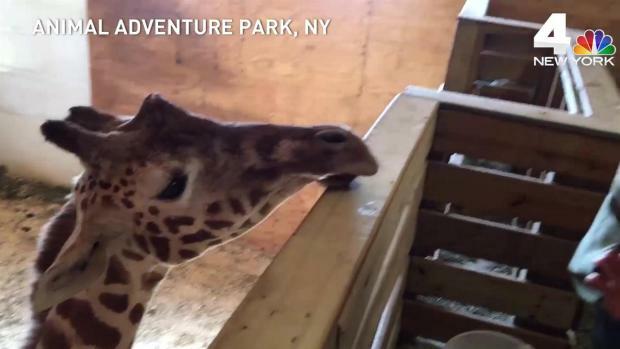 South Carolina photographer Erin Dietrich, then pregnant with her fourth child, went viral last month when she donned a giraffe mask to imitate April, the famously pregnant giraffe who took her time giving birth at Animal Adventure Park in Harpursville, New York. Dietrich's clip shot her to stardom as well, and she was dubbed "Giraffe Mom." April finally gave birth to a male calf last weekend, and Dietrich and her own newborn son, Porter, whom she welcomed in March, recently made a trip to meet them. We checked in on April the giraffe at Animal Adventure Park Friday, March 3, to see how she and her keepers were getting on ahead of the birth of her new calf. "It was so cool to be able to go to the zoo and to meet April and her baby," Dietrich said in a video posted on her Facebook page this week and taken at their hotel. "It's been crazy because people literally recognize me and ask me to take pictures with me and I'm super awkward on the other side of the camera," she said. "I should be taking pictures." Dietrich also said she planned to return in the summer with her whole family. She and her husband also have three other children. While Dietrich spoke, baby Porter woke up a couple of times because his pacifier fell out. "He's so tired. Poor guy. He's been such a good sport," Dietrich said, later picking him up. "It's just been surreal," she said. "I still don't know, I'm like, 'How did this all happen?' Because I was like 100 weeks pregnant, dancing around in a $16 Amazon giraffe mask. But we're so thankful that we have this story to tell Porter and all the people we've met and things we've gotten to do because of this overnight viral video." "Inside Edition" had flown Dietrich and her son to the zoo and orchestrated the giraffe mommy meetup. "We're buddies; we're companions," Dietrich told the outlet about April. "She just doesn't know it." April's calf has not been named yet and the park is holding a fundraising contest to name him at nameaprilscalf.com for $1 a vote. A change.org petition was recently launched to name him Porter.